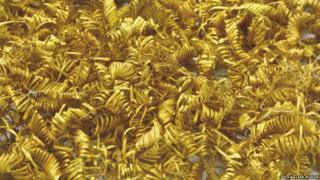 Archaeologists are mystified by nearly 2,000 tiny golden spirals dug up in a field in eastern Denmark. The coils, made from thin filaments about 3cm (1in) long, date from between 900BC and 700BC, according to Flemming Kaul of the National Museum in Copenhagen. But he and his colleagues aren't quite sure what they have found. "The fact is we don't know what they were for, although I'm inclined to think they were part of a priest-king's robes, perhaps a fringe on a head-piece or parasol, or maybe woven into cloth," he says on the museum's website. The gold spirals will go on display at Skaelskor City Museum next week. They were unearthed in the Boeslunde area, a rich source of Bronze Age gold artefacts. Several gold cups and rings have been found there in the past 200 years. Remnants of a fur-lined box uncovered nearby suggest the coils were cult objects from the time when the Danes' ancestors worshipped the Sun, according to West Zealand Museum archaeologist Kirsten Christiansen. She is conducting further digs in the area, in case there's more treasure lying beneath the soil.